Discussion in 'Computers, Cabling & Other Miscellaneous Hardware' started by stevendi, Oct 17, 2011. Here's a question for Renard user/builders. Anyone know another source for the resistor network used:- 10pin 680ohms 2% (Mouser part no. 266-680-RC). So far I can only source from Mouser or Active Components. Element 14(Farnell) & Futurlec don't list them. Mouser del. costs too high, Active want $100 min order! I don't think you'll find that type / value locally easily. There is a simple solution however. 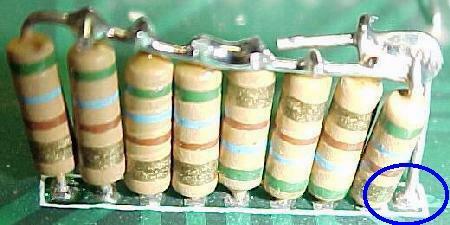 The network is made up of 9 resistors. Pin 1 is the common. So all you need to do is grab nine 680 Ohm 1/4 resistors and you're done! I can post you some if need be. I can see how that could be a solution, kinda untidy though, but hey who looks at the board? That would also explain why it all goes a bit weird when you put them in backwards. LOL - yes, the "commoned" type of resistor network must be installed the right way around. The dot or stripe denotes pin 1 (the common).